Like a mysterious movie set, the moss-fringed curtains of Caddo open on fascinating history and abundant wildlife. If the film industry had existed 150 years ago, Central Casting would have found an abundance of raw talent in the watery Northeast Texas enclave that encompasses historic Jefferson, meandering Cypress Bayou and mysterious Caddo Lake. Over the decades, movie directors could have filled such diverse roles as Indians, settlers, riverboat captains, blacksmiths, pearl divers, oilmen and roustabouts, gamblers, fancy girls, merchants, slaves, soldiers, carpetbaggers, songwriters, butchers and plantation owners with no lack of drama, romance, chicanery and fortune-hunting to tell their stories. The location scouts would have salivated over the artistic array of cinematic possibilities, and they still do today. Here are some of Texas’ oldest structures. Lush woodlands, pastoral meadows, pristine and spectral bayous and lakes abound today, much as they did in the late 1830s when Allen Urquhart acquired a tract of land on a bend in Big Cypress Creek that would become Jefferson. When Urquhart laid out the town site in 1842, Daniel Alley joined his 586-acre parcel to the survey for additional streets. Some ran at right angles with the bayou, some with points on the compass. A distinctive V-shaped city resulted that is now the Marion County seat located at the junction of U.S. Highway 59, Texas Highway 49 and Cypress Creek. The first steamboat, the Llama, reached Jefferson in late 1843 or early 1844. With persistent efforts to improve navigation, steamboats soon traveled to Jefferson from New Orleans and Shreveport by way of the Mississippi and Red rivers, Caddo Lake and Cypress Bayou, bringing supplies and manufactured goods, fashion and fine furnishings to many of the early palatial homes and grand churches. 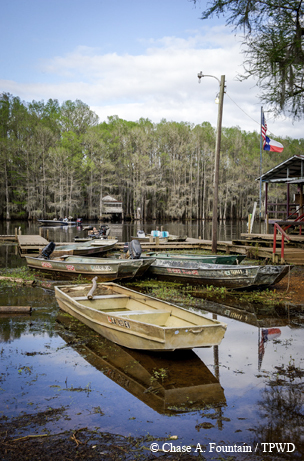 At Johnson's Ranch Marina, boats await their next journey on Caddo Lake. The shallow-draft vessels and steamboats returned downstream, transporting hides, pickled beef, raw materials and other produce. Slaughterhouses, canneries, iron works and shoe and garment factories followed as antebellum Jefferson emerged and a Civil War economy flourished. As the leading commercial and distribution center of Northeast Texas, Jefferson became a cotton shipping hub for the region. By 1870, more than 75,000 bales of cotton were being shipped annually, with only coastal Galveston surpassing Jefferson in commercial volume. Progress and prosperity came at a cost. Booming business brought no regard for the area’s abundant and beautiful natural resources. By 1873, Jefferson could boast street lighting and the first ice factory in the state. But two seminal events occurred that year that eventually spelled the end of Jefferson’s 19th century importance. The first was destruction of the Great Raft, a natural dam of tree trunks and roots on the Red River around Shreveport. Nitroglycerin charges helped remove the last portion of the raft, making the upper section of the river navigable but significantly lowering the water level of the surrounding lakes and streams. The trip to Jefferson became difficult, particularly in times of drought, and by the early 1900s, river commerce was dead. Even more central to the city’s decline was the completion of the Texas and Pacific Railway from Texarkana to Marshall, which bypassed Jefferson. Luckily, over the years the “nasty” state of affairs has turned back to “enchanting.” Guests on Nance’s 22-passenger boats enjoy towering bald cypress, sweet gum and holly trees, loblolly pines, dogwoods, cottonwoods, water oaks, pin oaks, overcup oaks and river birch. Seasonal wildflowers abound; purple-fruited American beautyberry and the medicinal and ornamental marsh mallows are late summer standouts. 4 to 6 feet deep. The U.S. Army Corps of Engineers has designed and built an in-stream fish-spawning area using large, small and medium rocks within the streambed of the bayou to encourage spawning by the American paddlefish and by 34 other species of native fish that migrate upstream each year from Caddo Lake to Jefferson to spawn. A relatively new boat ramp on the east end of town was constructed with the help of the Texas Parks and Wildlife Department to improve access by anglers and boaters, and a paddling trail is under consideration as well. The Historic Jefferson Railway features a 36-inch narrow-gauge railroad with a 50-year-old reproduction of an 1870s American class 4-4-0 steam locomotive called the Robert E. Lee. Riders enjoy a scenic, narrated tour while rolling through five miles of history-laden Pineywoods wetlands and landscapes. The historic Jefferson Ordnance Magazine is the only Civil War gunpowder storage structure left in Texas. 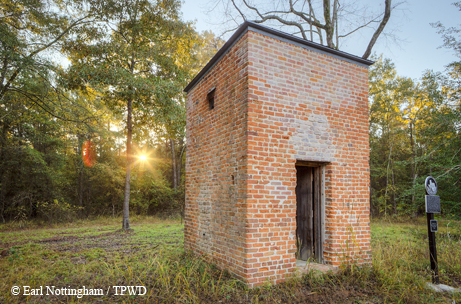 Along with ruins of the Clark & Boice Sawmill and East Texas’ first iron foundry, passengers also get one of the best views of the only freestanding, Civil War-era powder magazine in Texas. The restored Jefferson Ordnance Magazine, one of three originally, is located on a donated, 4-acre preserve, Baldwin Park, on the opposite riverbank. The structure, recognized by the National Park Service and the Texas Historical Commission, is owned and cared for by the Historic Jefferson Foundation, which opens it only for such special occasions as the Civil War Symposium (being held Aug. 15 this year). Fifteen miles east of Jefferson you’ll find Caddo Lake, Texas’ largest natural lake, which straddles the Texas-Louisiana border. Like the old town and the bayou, a sense of mystery and history imbues the lake, enhanced by the ghostly drapes of Spanish moss hanging thickly from the limbs of overhanging cypress trees and the seemingly endless twists and turns of the waterways. It looks like a place where you could be easily lost, stranded for eternity in the land of ghosts and fables. Even the formation of Caddo Lake is shrouded in myth and mystery. Legend has it that a Caddo chief disobeyed the Great Spirit, who then sent an earthquake to flood the chief’s village. For many years, people linked the formation of Caddo to the historic New Madrid, Mo., earthquake of 1811. More plausibly, the shifting Great Raft on the Red River, with logs piling up in the upper section and rotting away in the bottom section, reached a point in 1800 where it caused the Red to break out and flood Big Cypress Bayou. For centuries, Caddo Indians settled in the area. They hunted wild game with bows and arrows, fished, and farmed corn, beans and squash. They built ceremonial centers and maintained trade routes with remote areas. 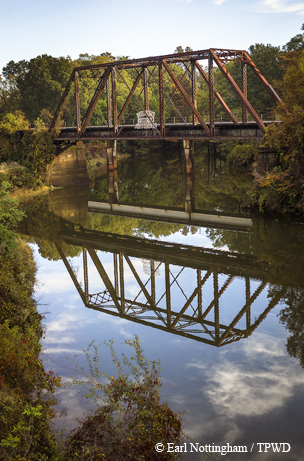 The "turning basin" on Cypress Bayou was once a bustling port. The Great Caddo Lake Pearl Rush began in 1909 when an oil rig cook, George Murata, found these natural gems while preparing Caddo’s freshwater mussels for the crew. Soon, as many as 500 tents were set up on the shore and hillsides of Potter’s Point, as fortune hunters, known as “pearl hogs,” joined in. Most hunters became discouraged after a few weeks and went back home to farm, but some “hogs” were successful. A 1913 U.S. Bureau of Fisheries bulletin reported that in 1912, the value of pearls taken from both the Louisiana and Texas sides of the lake was $99,200, or around $1.9 million in today’s dollars. In 1914, a crude earthen dam was built to help raise the water levels that had dropped with the dismantling of the Great Raft. As a result, the mussel beds were covered with deep water, bringing the pearl rush to a halt. In the 1930s, the Civilian Conservation Corps built rustic facilities at Caddo Lake State Park, many of which are still being used today. During that construction phase, the U.S. Army had 15 barracks and an Army mess hall that were converted into nine log cabins and a group recreation hall that are still in use. There is also a CCC pavilion and remnants of original picnic sites and a latrine along the trails. In 1970, the original earthen dam was rebuilt, and Caddo’s future as a lake was secured. 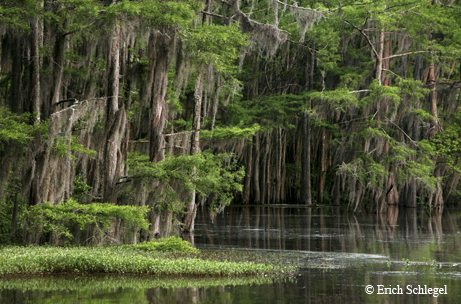 In 1993, Caddo Lake became the 13th Ramsar site in the United States. The Ramsar Convention on Wetlands, initially signed in 1971, is a treaty to protect wetlands worldwide. There are now more than 1,900 designated Ramsar sites around the world and 29 sites in the United States. The original Ramsar area in East Texas included approximately 8,000 acres of public land — 500 acres in Caddo Lake State Park and 7,500 acres in the Caddo Lake Wildlife Management Area. It was expanded in 1998 to include approximately 11,700 additional acres. There are many reasons for the designation. Caddo Lake is one of the best examples of a mature flooded bald cypress forest in the United States. Another is the important population of plant and animal species dependent on the specialized habitat of Caddo Lake, including the peregrine falcon, the alligator snapping turtle and the eastern big-eared bat. The wetlands are critical for migrating birds and indigenous fish, and the area boasts one of the most diverse communities of plants in Texas, if not the country. 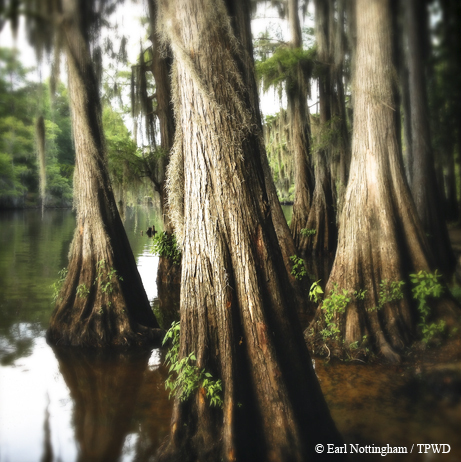 For many years, Caddo Lake has been threatened by a number of non-native plants and animals, such as hydrilla, water hyacinth, Chinese tallow and nutria. In 2006, the latest invasive species — giant salvinia — was found in the lake, and it may pose the greatest threat because of its rapid growth. Giant salvinia can severely limit fishing and boating access as well as displace native beneficial plants that are used as habitat by fish. Once it becomes established, it is nearly impossible to completely remove. TPWD crews have been successful in eradicating giant salvinia in some areas when it was spotted early. The beautiful strands of Spanish moss draped over the bald cypress trees are not an invasive problem; in fact, that moss exists only in clean air, so it serves as an air-quality indicator. Not much has changed at Caddo Lake and Cypress Bayou from those early days of mystery and wonder. The eerie moss-draped trees and abundant wildlife are still a throwback to centuries gone by. Caddo is a place to be explored and experienced, preferably with a head filled with lore and a heart open to the ancient beauty that lies around every bend.